An iPhone case which transforms into to a video game controller has hit the popular crowd-sourcing site Kickstarter this weekend. The concept case is only 3mm thin, but contains the traditional directional pad and button configurations seen on many classic handheld games consoles. 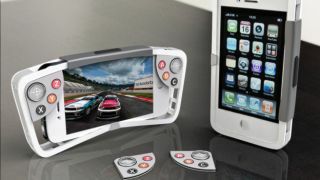 To the naked eye, it looks like a regular iPhone case, but snapping it from the centre reveals the controls and alters the shape of the case to make it easier to grip for gamers. The case connects to the iPhone via Bluetooth 4.0 and is charged by Solar power and indoor light sources. The creator Justice Frangipane has been working on the controller for over a year and has now teamed up with the iDevices company to help make the project a reality. Most importantly, Frangipane says the project also has Apple's support. He said: "iDevices contacted Apple on my behalf and we are happy to announce that Apple is not only going to support us, but willing to devote a team to making sure that this controller works perfectly with Apple iOS devices!" The project requires a $135,000 (UK£83,490, AUD$129,772) bounty to officially go ahead and you can see the latest prototype in the video below.